Having followed Playworld Superheroes for a while I’m excited that everyone will be able to get there hands on it on 29th January. It’s from the development skill that was behind Wipeout and Motorstorm and it shows. Something like a cross between the crafting of Tearaway and the adventuring of Disney Infinity with a little Infinity Blade thrown in for good measure. Currently you may not have heard about Playworld Superheroes, but it looks like it’s the start of something that will be come expansive and substantial for families. Best of all though, once you’ve paid to download the game (around $2.49) there are no in app purchases. Our review of WWE Immortals is here. The “Bronze Heroes” seem pretty rad to us! Rigorous Training – ~ gains increased SPEED when he’s below 40% health. Technical Expertise – ~ When ~ uses a special move, he has 30% increased SPEED for a limited time. Frost Shield – ~ provides a HEALTH increase to her teammates. Pyromancer – ~ boosts her team’s damage by 5%. Mystic Offense – ~ and his team have 10% increased SPEED. Big Landing – ~ Big Show does damage when tagging in. Landing damage increases as ~’s HEALTH increases. Queen of Ravens – When ~ uses a signature attack, her teammates regenerate ADRENALINE 15% more quickly for a limited time. Demonic Power – ~ deals 15% increased Damage when he tags in with less than 20% health. 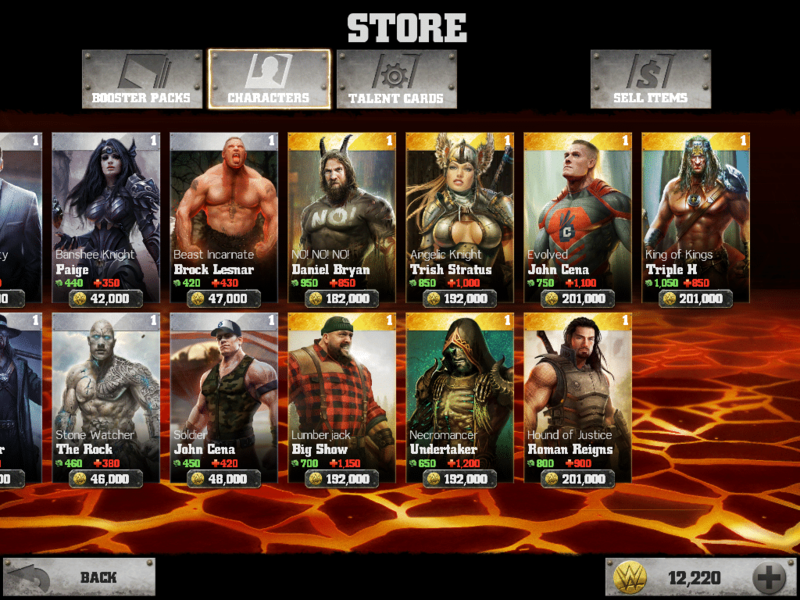 The mid tier characters in WWE Immortals! Moon Shield – 6pm-6am, when ~ tags in she gains a shield that REDUCES DAMAGE TAKEN by 50%. Sun Aura – 6am-6pm, when ~ tags in, she is surrounded by a burning sun aura that deals damage over time. Mystic Defense – ~ and his teammates have 10% increased HEALTH. 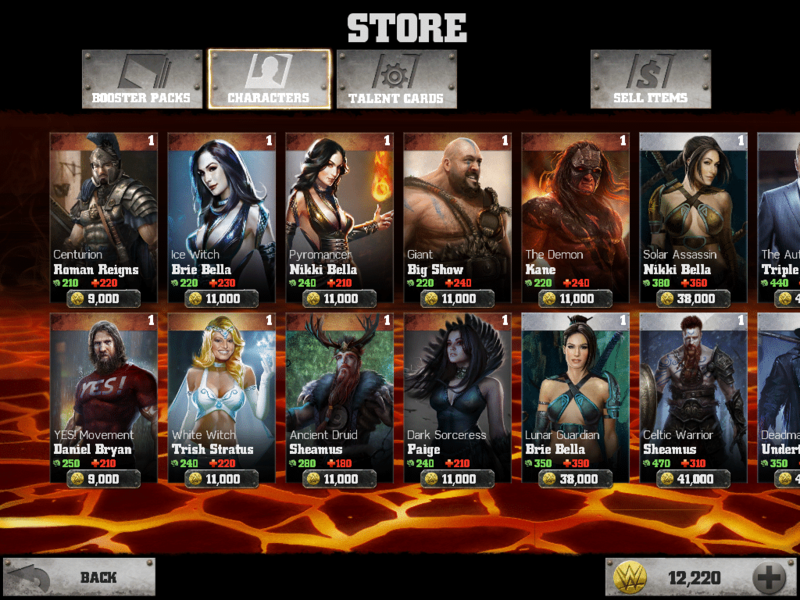 Best for Business – ~ and his team game a 10% DAMAGE increase for each gold character on the screen. Deadman – Once per match, ~ will rise from the grave with 33% health and max ADRENALINE. Mistress of Death – After using her Finisher, ~ grants her teammates a burst of ADRENALINE. Electifying Tactics – When ~ hits with a signature attack, he deals 25% more DAMAGE with basic combos. Conqueror – ~ deals 15% increased DAMAGE after defeating an opponent. My Time is Now – When ~ tags in, his next special attack will deal 20% additional DAMAGE. Building Momentum – When ~ performs a Signature Attack, he gains 30% SPEED and deals 30% more DAMAGE. Big Defense – After tagging in ~ takes 65% REDUCED DAMAGE for 6 seconds. White Aegis – After ~ bl;ocks damage equal to 10% of her health she grants her team a bonus 25% ADRENALINE regeneration for 6 seconds. Soul Collector – Every time an enemy is knocked out, ~ gains a 25% DAMAGE increase. Will to Win – ~ deals bonus DAMAGE with Basic Attacks as he loses HEALTH. Powerhouse – ~gains 50% DAMAGE increase when he’s below 40% HEALTH. Cerebral Assassin – Each time ~ KOs an opponent, all remaining opponents lose Adrenaline. Beast Quest for iOS and Android is Coming Soon! We have a closer look at the new Beast Quest video-game for iPad and Android tablets. In this video we meet new enemies and beasts as well as explore more of the world of Avantia. It all culminates in a massive battle with Sepron as Tom tries to free him from the evil curse of Malvel and get the enchanted chain off his neck. We spoke to Ben Meakin at Miniclip about the game. Why should kids play Beast Quest? It combines some of the best elements of games like Zelda and Infinity Blade into a compelling single player adventure. Beast Quest fans will love seeing the worlds and characters they know coming to life, and those new to the books will quickly see why it’s so popular. There’s treasure to find, different worlds to explore, and of course huge screen-filling Beasts to battle. What’s the most awesome thing in Beast Quest? Picking a single thing out in Beast Quest is tough, as there is so much to talk about! From seeing the awesome Beasts in brilliant 3D to the fast-paced combat against multiple enemies, there is loads to enjoy. However, if I had to pick one thing, I’d say the huge open worlds are the heart of what makes Beast Quest great. With six huge worlds based on each of the original books, there’s a ton of things to do, see, and battle. Mobile games have been getting a bad rap for years. A huge percentage of the population views them as free-to-play throwaway games. This makes a lot of people very hesitant to spend money on a mobile game. This is unfortunate because there are some real gems out there. One of the best of them right now is 80 Days. 80 Days is a resource management game hidden within a beautifully illustrated visual novel. The premise is built around the classic novel “Around the World in Eighty Days” by Jules Verne. Players take on the role of a steward for an eccentric British gentleman who makes a bet that he can travel around the world in less than eighty days. This is no real problem now, but since the story takes place more than 100 years ago it presents some serious logistical challenges. Players need to make careful decisions about riding by car, boat, airship, underwater train, or even walking city (Yes. I said walking city. Head towards Calcutta. You’ll see). The different modes of transportation all vary by duration, departure schedule, and comfort so you will need to balance them carefully to make sure you don’t run out of time or money. You’ll also need to keep your boss happy. If he becomes too uncomfortable the game is over! The game starts in London and as the game begins you are provided with a few different routes of travel to choose from. You select your mode of travel and are tasked with deciding your next route upon arrival. You can do this by purchasing maps or even exploring the city. You have to be careful not to spend too much time exploring though, because you might lose a whole day waiting for a motorcar or train to come back and depart! The excitement of arriving at a new city and figuring how much time I had before I had to run was a highlight of the game for me. All of this is wrapped up with gorgeously drawn backdrops for each of the featured cities and modes of transportation. The minimalist art style is very reserved in its use of color, but it is strikingly beautiful regardless. If you are a member of your family has any interest in illustration you could spend hours looking at this game. With all of that said the hidden strength in this game is its potential as a teaching tool. We live in an era where world geography (and to some degree even local geography) is not a heavy focal point. This game forces players to learn it in order to be successful. It certainly would not replace a geography curriculum, but it is far less costly than most sets of flash cards and will be far more engaging for the user. 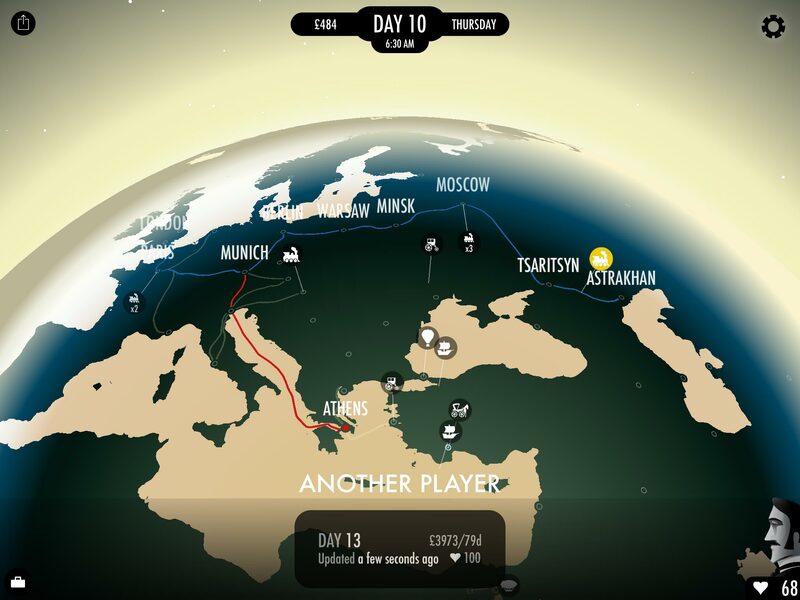 The 80 Days world map is minimalist, but includes everything you need to play! I consider this game to be family friendly. It is a visual novel so there is very little in the way of inappropriate imagery. Some of the cities you encounter are in war-torn areas, but there is nothing to be concerned about. Concerned parents can play through the game once be3fore sharing it with their children, but this is more than appropriate for almost every family. 80 Days is a challenging game that is almost unplayable unless the player is a very good reader. They could randomly select destinations, but there are clues hidden in conversation that are vital to success. This is, however, an excellent game for parents or older siblings to play WITH their children. One party simply reads the text and players can discuss the different options. The clock does continue during most phases of the game so people will need to think and negotiate quickly, but that is half of the excitement! In a world dominated by mobile games that are free to play this is a game that is worth every penny and more. There is a lot of entertainment here for less than five dollars. Angry Birds Transformers is a great fusion of the Angry Birds franchise and the golden era of Transformers . It also makes an awesome run and gun game. The game play is very different from the other Angry Birds games in the series and that is a good thing. You control a bizarre Angry Birds themed Transformer as you run at a set pace and tap on the screen to target the standard blocks in the background. The goal is to hit the delicately balanced towers in just the right spot so they will collapse and explode under the pigs. When I first saw my youngest son play Angry he was excited and yelling at all the action on the iPad and I scratched my head at the unique game play, there is a lot going on with this game. Your robot runs left to right with his blaster gun flashing away trying to topple the familiar block formations. All the while piggies fire back and statues fall while friendly robots drop in to help and blow everything up. Of course as it is a Transformers game you get to transform and roll out past the dangers of the stage. This game is exciting enough that parents won’t mind playing this with their kids. The cartoonish violence is turned up a few notches here as all of the Transformers are using energy blasters all of the time. If you don’t allow your children to play with toy guns or experience gun violence in your games then you will have to pass on this game. Lasers aside the action is not graphic and nothing even really gets visibly wrecked other than the blocks. The controls are easy to use and only take a few games to get the hang of. Once you have the basics together none of the levels will be too hard if you can use your powers correctly. This game may get too difficult for the kindergarten and under crowd very quickly, so keep an eye out for frustrated children. A stylish and gorgeous mash up of Angry Birds and original Transformers needs to be experienced no doubt. This game is fun and everything I need out of a mobile game short levels simple gameplay. Angry Birds Transformers is free to download and as far as I’m concerned it deserves a spot on the family tablet. I give it a full recommendation. Disney Hidden Worlds, a free-to-play and official release, takes players to the sky island of Inkspire, home to the Inklings, who craft Disney worlds out of magical ink. Each themed level represents a well-known Disney film. The game includes classics like Peter Pan and Beauty and the Beast, but also modern releases such as Tangled and Frozen. As play starts, a mischievous ink villain has sabotaged the various kingdoms, threatening to alter their plots. To save them, players must work through each world, scene by scene, repairing missing pieces and righting the story. Obviously, this set-up serves as an excuse to revisit familiar Disney favorites, which is always fun and nostalgic. However, it doesn’t feel gimmicky at all. Inkspire and the Inklings have a quirky style and personality unique to themselves. They fit well among the Disney characters and universes we already know, and I found myself genuinely interested in their story on its own. There’s also a particularly positive emphasis on creativity, art, and imagination that really shines. Regarding gameplay, Disney Hidden Worlds is a hidden object game. It presents players with a still image taken straight from the film and a list of objects hidden throughout the scene. The player must find and tap these items, gaining bonus points for speed and accuracy. It’s a test of observation that’s surprisingly varied and challenging. Players will find some objects in places that make sense but may be easily overlooked, like a bird’s nest in the trees, while they will also have to look carefully for other items hidden in just plain silly places, like a cheese wedge supporting the roof beams. To mix things up, particular scenes contain timed challenges that unlock bonus rounds. When completing scenes, players collect bottles of ink and other materials used to repair pieces stolen from the story. Every piece requires specified materials and takes a certain amount of time to complete. Once finished, these can be used to unlock new scenes and advance the level. Since these crafts require multiple ink bottles, players must replay scenes before it’s possible to obtain the items necessary to move on. To maintain a challenge, the list of hidden objects changes, even when the scene remains the same. Only the list changes, however. Objects remain fixed; previously listed items will be found in the exact same place as before. This quickly starts to feel tedious. Yet, at the same time, it becomes a great test of memory and helps strengthen recall skills. As you’d expect from Disney, content is appropriate for children of all ages. Since the game only requires tapping, controls are easy. However, there’s quite a bit of simple story text, so reading comprehension skills are a must. Regarding difficulty, some objects are easy to find, while others purposefully blend into the environment and are actually quite hard to spot. This tests patience as much as observation. Luckily, there’s a hint button that will highlight any remaining objects. This keeps everything accessible for younger children, though I admit that even I needed a hint now and then. Since an object’s location within a scene never changes, the challenge becomes more about memory once it’s been found. It’s been out for a few years now, but Clash of Clans still boasts an active community of players. With a special Halloween-themed update released last week, it’s not too late to give it a try. Clash of Clans is an easy to learn, if a bit simplistic, entry in the strategy genre. As town chief, players spend their time building up a village and assembling an army of fantasy creatures. Players take on both roles of protagonist and antagonist as they defend their home from attack, while also raiding and plundering the villages of other players. To survive, they need to master both an offensive and defensive strategy. Gameplay starts with the village. It collects and stores resources used for building projects and army training. Collectors harvest gold and elixir on their own over time, though the player determines their efficiency through upgrades. Once constructed, buildings require little oversight and the player focuses energy on village defenses. Villages remain vulnerable to attack by other players’ armies, which steal any unprotected resources. Walls and cannons provide a simple defense in the beginning, but higher levels grant access to an advanced arsenal including a variety of guard towers and booby traps. Upgrades to existing defenses increase protection and refine their appearance, transforming a sticks-and-stone village into a robust fortress. The game’s simplicity works very well here. Each piece’s use is straightforward and easy to understand, but it’s in how they’re put together that they become more sophisticated. This makes it accessible to the player who wants to hurry up and go fight goblins, while presenting plenty of tools to players who enjoy analyzing and tinkering with every element of their defensive strategy. This is where creativity comes into play. With imagination and planning, tactically-minded players can directly manage everything, perfecting their village layout to surprise invaders in new ways. It’s as simple or complex as you want to make it. Protecting the village only makes up part of the puzzle. Players must also muster a diverse army if they want to rise in rank on the leaderboard. In the single player campaign, players raid the Goblin King’s villages for gold and elixir, overcoming unique defenses and traps each time. In multiplayer, players can also raid the villages of other players, either gaining or losing victory points according to the outcome. Multiplayer raids form a major component of the game, especially after joining a clan. Clan members take part in two-day “wars” against opposing clans. On the first day, members exchange troops and ready defenses. On the second day, they raid the enemy’s villages. At day’s end, the clan with the highest score wins, and its members enjoy the spoils. Offensive strategy in Clash of Clans entails less hands-on control. Players choose which units to deploy and where, but cannot issue any additional orders. Troops act autonomously, bashing an obstacle to dust before attacking the next object in sight. This means that sometimes a warrior starts destroying a stone wall even if he’s standing right beside a gleaming heap of coins or is being blasted by a cannon corps. However, advanced unit types prefer to strike specific targets like walls or treasure, balancing this. Therefore, strategy relies less on control and more on making smart decisions about who to send, where, and when. As a spectator to the chaos, players may feel helpless at first, but lost troops replenish quickly, making it easy to learn from mistakes. The unpredictability provides a challenge, especially as the maps become more complex. This may frustrate players who want to interact directly during combat or enjoy micromanaging tactics. On the other hand, it makes combat–strategy aside–incredibly simple to control. It only takes a tap. For younger players, that means a large enough army will eventually smash through anything. It’s fun to watch and exciting not to know exactly what will happen next. On the surface, the game is cute, colorful, and bright. Depictions of violence remain benign and cartoonish. Characters only attack buildings and objects, not each other. Characters that die turn into ghosts and vanish. Ultimately, though, the game is about war. Specifically, destroying other players’ villages to steal their stuff. Despite this, the game is very forgiving and fair. There’s no permanent destruction or loss. Buildings remain intact, and lost resources quickly renew. It feels more like a competition than a war, but the central themes may concern some parents, especially of younger children. As with many free-to-play games, Clash of Clans features countdown meters on its building projects, and allows players to spend real money to speed up progress. The system feels fair and isn’t exceptionally prohibitive. However, parents will want to check their device’s pay lock. Parents should also be aware that there is an in-game chat feed. Most chatter regards joining clans and shouldn’t be anything to worry about. The controls don’t require any more reflex, speed, or precision than it takes to navigate the device itself. Playability mainly concerns the ability to strategize. Though advanced players can find ways to make strategy more complex, the game remains simple enough that it’s accessible to a wide range of ages and skill sets. Players need to manage resources, but the system also manages itself. Though problem-solving skills will benefit players as they figure out what troops are best against which defenses, a big enough army will eventually get the job done no matter what. Frankly, it’s fun to watch the army destroy things, whether they win the battle or not. Clash of Clans is a delightful and simple introduction to the strategy genre, while giving players the tools to get creative and imaginative. Players who need fast-paced or hands-on combat will be disappointed. While it may also disappoint those looking for an intellectual challenge, it provides light and whimsical entertainment without a steep learning curve. Which Spider-Man is in Spider-Man Unlimited? All of them—or close to it. The makers boast that the game contains more playable Spider-Men ever. How do they manage that? Handy narrative magic, of course. Spider-Man’s nemeses, the Sinister Six, have opened an inter-dimensional rift, threatening to destroy the world as we know it. Spider-Man must recruit alternate versions of himself from across the dimensions and defeat each member of the Sinister Six one by one. Unfortunately each member is recruiting his own dastardly alternates, meaning the road ahead will not be easy. Spider-Man Unlimited plays like an infinite runner, but isn’t endless. You spend missions collecting vials, avoiding obstacles, and punching enemies. The courses also have segments of web-slinging across buildings and freefalling from rooftops. It’s lively and responsive, perfectly capturing the feel of Spidey’s acrobatics. The comic book art style looks clear and vibrant on touch screen devices. There’s impressive detail in the various environments. Regarding gameplay, the variety of enemies and obstacles prevents missions from feeling tedious and repetitive. The game’s three modes accommodate different types of players, letting you play how you want. If you prefer to focus on ranking on the leaderboards for unique prizes, there’s event mode. If you want to rack up a high score to dominate your friends, there’s unlimited mode. If you’d rather collect as many Spider-Men as possible and complete each issue of the story, you can. The Spider-Man recruitment mechanic will be familiar to anyone who plays collectible card games. The random summoning process means you never know who you’re going to get. Each version of Spidey has a distinct look, unique bonuses, and a ranking based on rarity. There’s also a description of his place in Marvel lore. This appeals to longtime Spidey fans but remains fun and informative for newcomers. The game brings a bright and energetic experience. This remains consistent throughout, but the more the game advances, the more constricting the developer’s money-making tactics become. It’s a shame because there’s nothing to complain about when considering the game itself, but these restrictions soon start to spoil what’s otherwise a pleasure. 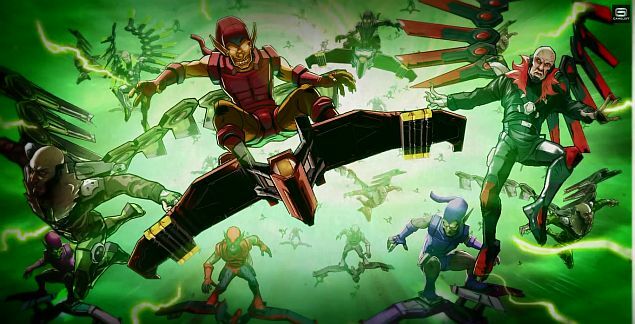 There isn’t much in Spider-Man Unlimited that the free-to-play model doesn’t limit. It’s possible to play without spending any real money, but if you’re looking to advance the story mode with reasonable speed it’s not realistic. In-game currency is readily obtainable through play, but not in helpful quantities when facing the costs necessary for advancement. The price in real currency isn’t much better. It takes just under $5.00 to summon a rare character and about $10.00 to increase a rare character’s level cap. But if you enjoy just being able to play, the non-story modes provide rewarding challenges without the prohibitive level requirements. I particularly enjoy the competition of event mode and find it entertaining on its own. Unfortunately, even those looking just to play soon hit another limit hard and fast: the Spidey Energy Meter. No matter the mode, every round of play consumes an energy point. Even successfully completed rounds deplete the meter, which maxes at five points. A point renews every ten minutes. An average round of play lasts about 30-60 seconds, so at best you’ll be waiting almost an hour for five minutes of play. This may be a common feature in free-to-play apps, but a game unforgiving of split second slip-ups is the worst place for a mechanic like this. While you can purchase energy refills for the equivalent of a few cents, you’ll hit the same problem five rounds later. Prepare to be frustrated. This game has “Unlimited” villains too! As you’d expect, the game contains plenty of comic book style violence. It’s the bloodless punches and kicks typical of the superhero genre, nothing you wouldn’t see on a similar children’s cartoon. Dialogue is geared toward a young audience, so there’s nothing to worry about here either. Storyboard sequences require reading comprehension skills but can be skipped easily. The controls are simple to learn and intuitive. However, the fast pace calls for quick reaction speed and precise motor skills. Combined with the skimpy energy meter, this makes the game nearly impossible for younger children to play since they can’t just get up and go again. Parents, please make sure to activate your device’s pay lock. It’s incredibly easy and tempting to rack up in-app purchases in a matter of minutes. The game itself is fun, fast-paced, and addictive. Spidey fans will appreciate the sheer amount of lore. There’s not much to lose since the game is free. But the money-making tactics are incredibly obvious, obstructive, and overshadow an otherwise well-made game. The fifth and final wing to be released for the Hearthstone: Curse of Naxxramas expansion is the Frostwyrm Lair. If you have not seen our reviews of Hearthstone or any of the expansion wings to this point they can be found here. Frostwyrm Lair is the reward for defeating the four wings of Naxxramas. 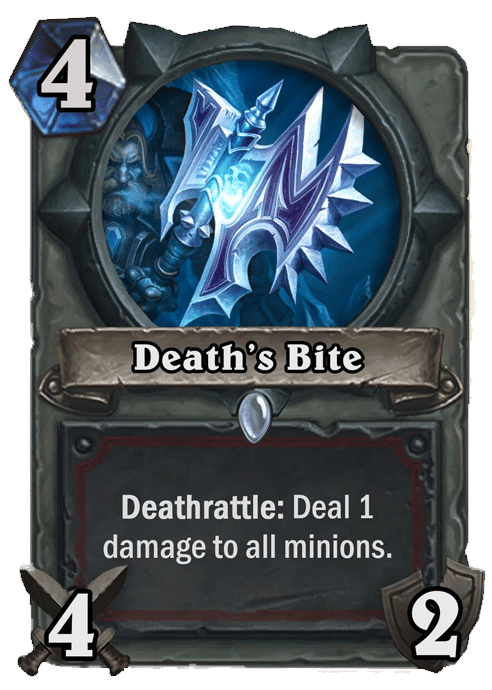 Inside you will not only face off with the giant Frostwyrm Sapphiron, but also the mighty (and terrifying) Kel’Thuzad!! Defeating these final bosses will unlock multiple epic cards and the legendary card Kel’Thuzad! First up is the previously mentioned Sapphiron. This fight is all about placement. World of Warcraft players will recognize this from the game mechanic that had to be used to keep your party members alive during the raid encounter. Here it keeps your minions immune to Sapphiron’s heroic power. The fight becomes simple once you figure that one. The reward for defeating this encounter is Echoing Ooze. 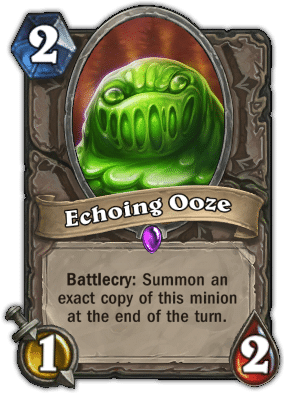 This card has a lot of potential in decks that that focus on buffing (improving minions through spells) as this creature copies itself at the end of the turn and includes any temporary effects that were on it. 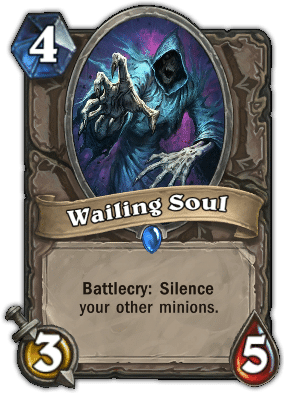 Once Sapphiron is defeated you will be able to face off with Kel’Thuzad himself. Be aware that he has two different phases and each has a different heroic ability. A key to this fight is getting through his ten points of armor as soon as possible as his second heroic ability costs eight mana. 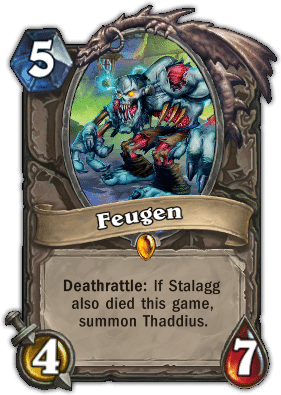 Two strategies that I have found successful have been using a fast deck like a hunter or a druid deck that helps build armor while still keeping up the pressure on Kel’Thuzad. 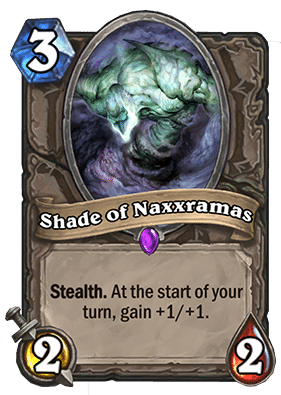 The reward for is the Shade of Naxxramas (my favorite card in the entire expansionPlayers are also rewarded with the legendary card Kel’Thuzad. 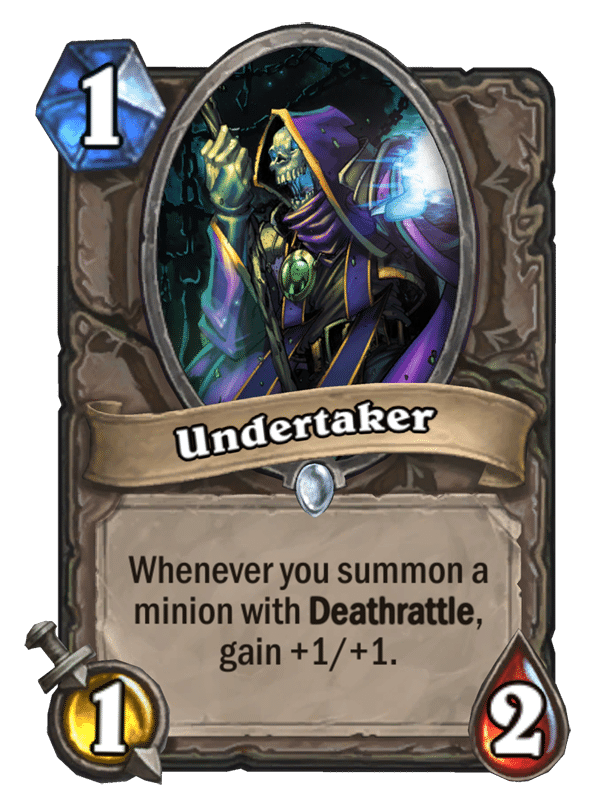 The potential to build around this one is vast, and I would not be surprised to see a lot of “deathrattle” themed decks in the near future. 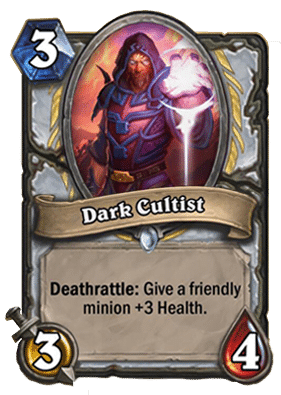 This will be a must own card in everyone’s collections as time goes on since he can help build some excellent strategies. 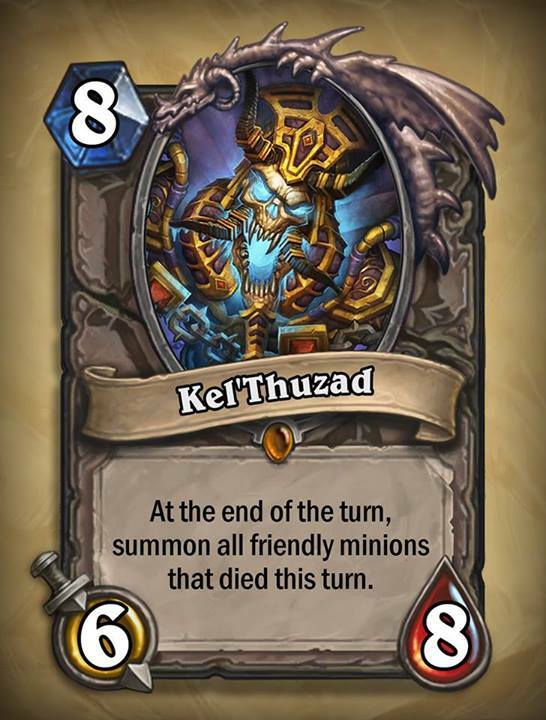 The final class battle is the Paladin who faces off with Kel’Thuzad. I have not defeated this challenge to this point, and have found the deck provided for this challenge is vastly underpowered. If you have found success with this please comment below as I am eager to see how everyone does it. The Heroic modes of the final bosses will certainly challenge even the most veteran players. Once all heroic modes are defeated a special card back is rewarded (Enter it here). So you will see it displayed proudly by players who have defeated this vastly challenging task. Overall I enjoyed the expansion a great deal. I found it to be fun for players of all skill levels, and the cards added certainly add a new flavor to the game. Personally I would have liked to have seen the normal mode be a bit more difficult, and the heroic modes toned down just a bit. But that is a minor criticism. I very much look forward to what the future of Hearthstone holds. What did you all think? Sound off below with any thoughts on the final challenges and the expansion as a whole. Until next time have fun, and stay tuned to Engaged Family Gaming for more gaming reviews. The fourth wing to be released for Hearthstone: Curse of Naxxramas expansion is the Construct Quarter. If you have not seen our reviews of Hearthstone or any of the expansion wings to this point they can be found here. The Construct Quarter is the last bastion of defense for Naxxramas before entry to Frostwyrm Lair can be earned. The most difficult bosses await a player as Kel’ Thuzad throws everything but the kitchen sink in your way! The final boss for this wing is Thaddius, and like the Military Quarter will challenge you in every way possible. The bosses within the Construct Quarter will challenge a player to think their way out of trouble as opposed to just throwing powerful cards at them. The rewards for victory are also more powerful and plentiful. First up is Patchwerk who actually has no deck of cards, and is just a brutal force himself. The reward for victory is The Undertaker. 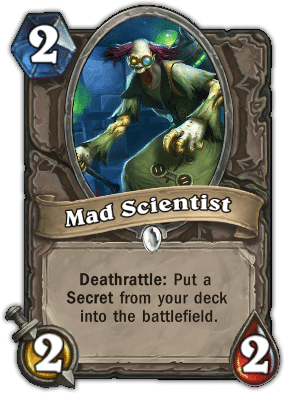 Defeating Grobbulous next will reward you with the Mad Scientist. 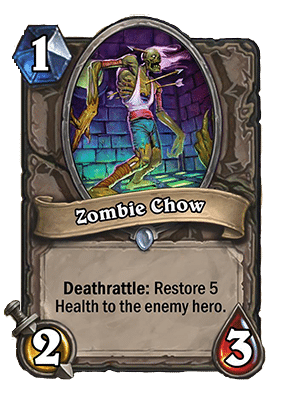 The next boss Gluth’s reward is Zombie Chow. World of Warcraft players may find humor in this reward as it harkens back to the Raid Boss fight. 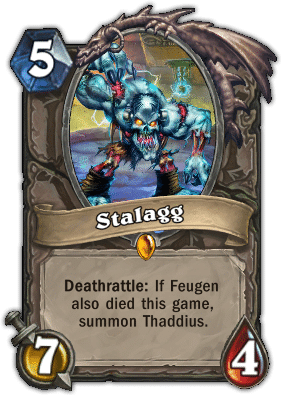 Finally defeating Thaddius rewards players with the Wailing Soul and two legendary cards Fuegen and Stalagg. 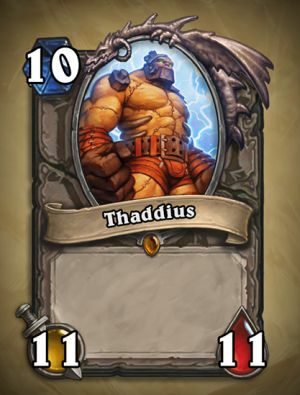 The two legendary rewards can potentially summon Thaddius himself for a player if the conditions are met. This has the chance to turn the tide of any game to a player’s favor. The two class challenges that are unlocked within the Construct Quarter are Priest and Warrior. Defeating these challenges will unlock the Dark Cultist and Death’s Bite respectfully. I found these challenges to be the most difficult to date. Much like the Military Quarter previously the Heroic bosses within the Construct Quarter pose a significantly enhanced challenge for players. Building a deck specifically to defeat these challenges is highly recommended. Overall the Construct Quarter did not disappoint as the final wing within Naxxramas. Playing through certainly felt as if the fights were building to a crescendo. Veteran players will find many new challenges awaiting them and will put a player’s deck-building skills to the test. Did you find the Construct Quarter to be as challenging as I did? Do you have an idea of what may lie next in Frostwyrm Lair? Sound off below with any thoughts and comments! Until next time good luck as Frostwyrm Lair opens on August 19th!